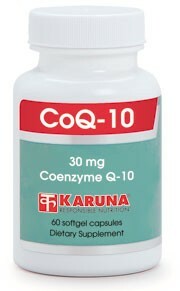 Coenzyme Q-10 occurs in cellular mitochondria throughout the body and is essential to their function and for ATP production. The areas of highest energy metabolism, including the heart and skeletal muscle, depend heavily on CoQ-10 for normal function and antioxidant protection. CoQ-10 levels decline with aging, and endogenous synthesis levels can also fall behind during times of high energy output, as well as in some disease states. A rapidly growing body of research has confirmed the participation of CoQ-10 in maintenance of blood pressure homeostasis, cardiovascular and brain function, and oral tissue health. 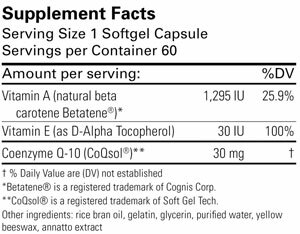 Karuna CoQ-10 products are encapsulated in softgels which contain a lipid-soluble medium that helps maximize the absorption and utilization of Q-10. Tissue depletion of CoQ10 levels by statin medications and red yeast rice suggest it would be prudent for patients using these agents to supplement with a small amount of CoQ10 (Ann Pharmacother 2006;40:290-4). Suggested use for adults: 1-4 softgel capsules daily taken with meals, or as directed.